A story of one woman’s journey to recovery from OCD. Sheri Bloom weaves a complicated web of real-life experiences that both influenced and culminated in her ultimate battle against OCD. Dr. Suzanne Mouton-Odum, a licensed psychologist who specializes in OCD, gives guidance to the reader about the development, conceptualization, and treatment of this disabling disorder. This book not only describes how it feels to have OCD, but also how to move to recovery. These two authors have created a vivid and intimately personal account of the suffering and treatment of OCD with a unique blending of patient and expert provider perspectives. Their collaborative work offers a creative and eye-opening view into the ‘rabbit hole’ of OCD and the tremendous challenges and rewards that accompany the road to recovery. Ms. Bloom’s candid sharing of her personal struggles and triumphs, interwoven with Dr. Mouton-Odum’s clear and knowledgeable description of the theory and practice of behavioral treatment for OCD, makes this a ‘must-read’ for sufferers and those who support them. 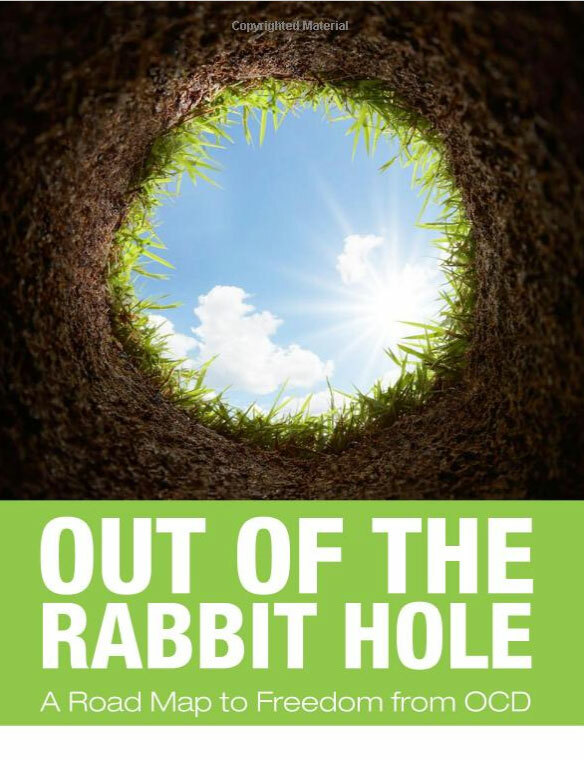 The road out of the rabbit hole is not easy, but this book offers hope and encouragement for sufferers who want to begin that journey. OCD is an irrational disorder. I heard once someone describe the pernicious thoughts of OCD as synthetic fruit: it feels like the real thing but isn’t, in actuality, real. Perhaps this is why mindfulness, as Dr. Mouton-Odum discusses in our book, is such a powerful tool to fight the “synthetic fruit.” When we allow ourselves to merely observe, we are more likely to find the inner strength to separate ourselves from irrational fears. To fight the doubting “beast” we need to sit with and observe our fears, and not act on them. Reassurance seeking will only lead us further down the abysmal rabbit hole. Out of the Rabbit Hole is truly a unique contribution to the OCD literature. Sherrie’s brave and inspiring story is highlighted through the therapeutic insight of Dr.Suzanne Mouton-Odum. Reading a book that illustrates the process of therapy through the eyes of a sufferer as well as a therapist makes for a fascinating experience. Thank you for the opportunity to experience both sides of the couch! Sheri Bloom is a published writer of fiction and non-fiction. Her children’s book, Dream Write (Fall 2013, Wonderland Press) empowers children to face their fears using insight and humor. Her challenging past ignited a love for helping others overcome their personal Achilles’ heels. A former English and theatre teacher, Ms. Bloom writes an inspirational blog: www.gotblooms.org where daily doses of spiritual sunshine can be found. Dr. Suzanne Mouton-Odum is a licensed psychologist in private practice in Houston, Texas. She has extensive training in cognitive behavioral treatment for Anxiety Disorders, Trichotillomania (compulsive hair pulling), and Obsessive Compulsive Disorder (OCD). She helps people of all ages who suffer from these problems. Dr. Mouton-Odum is a member of the Scientific Advisory Board of the Trichotillomania Learning Center, Past President of both the Texas Psychological Foundation and the Houston Psychological Association. She has published numerous scientific journal articles, presents at national conferences, and is the co-author of two books: Out of the Rabbit Hole- A Road Map to Freedom from OCD and A Parent Guide to Hair Pulling Disorder: Effective Parenting Strategies for Children with Trichotillomania. Dr. Mouton-Odum also is the Vice President of PsycTech, a company that translates psychological interventions into online, self-help strategies. She has been the lead developer of www.StopPulling.com, www.StopPicking.com, www.OCDChallenge.com, www.DaretoQuit.com, PullFree (iPhone application)and www.TicHelper.com (currently in development). These programs have helped thousands of people worldwide who otherwise would not have been able to access treatment.